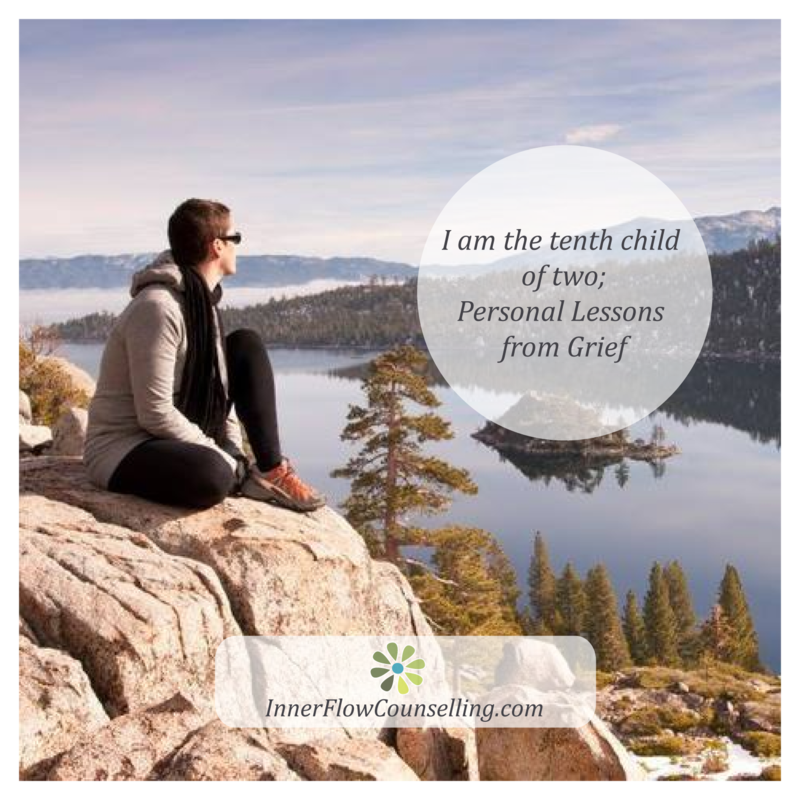 grief Archives | Inner Flow Counselling & Wellness, Yvette Lalonde, MTC. You could say that grief and I have an intimate relationship. In the 7 years between my sisters birth and mine my parents experienced a total of 7 miscarriages and the birth of one son, my brother Michael, who only lived for a few days due to structural birth defects. I’m the 10th child of only 2. My parent’s loss 8 children. My sister witnessed these losses for the first 7 years of her life. And as you can imagine there was little in the way of support in the 1970s. In fact, miscarriages are still something that many women and couples feel they must sustain alone. As with most loss but particularly with this type of loss, grief is often accompanied by guilt and shame. It wasn’t until my counselling training that I really started to unpack what all this meant for me. Gestating in a womb well versed in grief, fear, and sorrow; I thought these were natural states for me. I understood myself to be a sad person; I hid it very well but it was always there along for the ride. I felt fear deep in my bones; it informed so much of my life. As you can imagine there are layers upon layers of significance for me in the events that occurred all before my actual birth. I found validation through learning how the science of epigenetics demonstrates that this type of womb stress can modify the expression of a fetuses DNA. To be very clear, I, in no way, hold my mother in blame. Rather it has presented me with the gift of acknowledging her strength, fortitude, and resiliency. What have I learned from this intimate encounter with grief? Well, I’m still learning from it and suspect I and my whole family always will. This is not necessarily a bad thing. For me it is in the framing of it. It happened; nothing can be done about that. There is no shame and no blame. What I can do is be resourceful with how I work with it. Grief has taught me the importance of intentionally searching out joy and pausing to embody it. To really experience it, no matter how fleeting it is. Because I know it will eventually return. I realize in typing this that it has also taught me the lesson of impermanence. It has taught me to see the ways I grasp and the ways I avoid. To revel in and celebrate beauty. To cherish small things. I think this is why I can stare at a flower, a tree, or a bug and hold it in complete reverence. Grief has taught me to honour my sorrow by seeing it and holding it tenderly without letting it define me. To understand that I am not the sum of my past. I am not the expression of others grief. That my grief is as unique as your grief. To witness the birth, life, death, rebirth cycle. In moments, days, months, years, and lives. To hold space for death in all its forms. To see how it shows up in nature, in my transformation, in my clients, and loved ones. Grief can be paralyzing. I know this. It can feel like it is taking over your life, and honestly, I think that it is meant to. It is one of the hardest and wisest teachers I have experienced. I know this only because I turned around and faced grief. I held space for grief and wanted to allow it to transform me. She is a multifaceted mistress. Simultaneously debilitating and stimulating. Death is everywhere, in the falling of the leaves, in the setting of the sun, and in the ending of relationships and lives. Rebirth is also everywhere. In the decaying leaves that feed the buds that will bloom in spring. It is in the rising moon. In the understanding of why relationships and lives were important. I guess in the end I see that death and grief have informed my sensitivity to sorrow which has inspired my resiliency and engagement with life.